Two Parishes, 2800 people, around 1100 households....We're aiming to become one of the first truly low carbon communities in the UK. By acting together we can learn from & help each other and create real momentum and local pride. So what are we up to? Here you'll find details of all our current projects, and how you can participate in and enjoy them. From Bee-Friendly gardening to the community orchard - there's something for everyone. Details of all WFEG events are here. We also publish info on behalf of other like-minded organisations in the local area too. There are regular social events as well as community wide activities - all welcome! A wide range of information on all matters green plus our own newsletters and fact sheets. We add to it as regularly as we can. But if you can't find what you need - get in touch and we'll do our best to help. 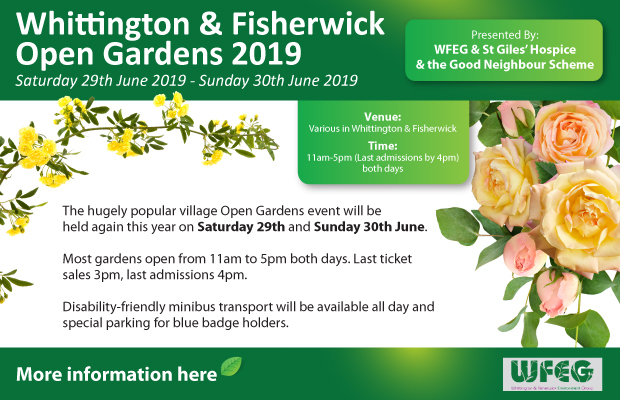 Open Gardens 2019! It's back - bigger and better than ever!